I was tempted to make the picture "large" so as to cover more space in hopes of hiding the fact that my review of this book would be very small. For you see, I have not yet read this book. Instead I chose to inflict it upon my SIL, poor, unsuspecting Caryn. She asked me to put together a curriculum for her for American History this year. I dutifully did all that she asked and searched out the best sources of information. Of Plymouth Plantation is perported to be one of the best and so I purchased a copy for her and fully intended (and still do intend) to read it myself. What follows is her impression of the book, followed by her younger sister, Jenny, who we all suspect will pitch fit over ever being forced to read said book. We shall see. It might prove one of those things that is so difficult an assignment that everyone has to partake of the "glories" to keep things "fair." Or perhaps we remind ourselves that life isn't fair so please hand me the next Montgomery book and let's get on with it! This is Caryn now with the green. (Or, it will be green once we fix the font color.) I am supposed to tell you about what I thought of the aforementioned book. I will now proceed to do so. I thought it was in-depth, informative and very long and boring. It is basically a journal that William Bradford kept around the time of 1608-1646. 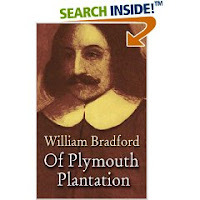 William Bradford cared more about getting facts correct than the enjoyment of the reader. "To all Christian People, greeting, etc. Whereas at a meeting on the 26th of October last, several persons whose names to the one part of these presents are subscribed in a schedule hereunto annexed, Adventurers to New Plymouth in New England in America, agreed... to sell and make sale of all the stocks, shares, lands... to the said adventurers and their fellow adventurers to New Plymouth aforesaid, in any way accruing or belonging to the generality of the said adventurers aforesaid;..."
And that's the shortened version. OK, it's not like everything that happened wasn't important, because the Pilgrims (and William Bradford) spent a lot of their lives working through technical difficulties of all kinds, it's just that... I'd rather spend my time reading about the more significant happenings than who wouldn't send somebody else as many goods as they were hoping for and learning the exact number and value of beaver and fox furs which were lost overseas during thus and such year. There are just too many details. Did I learn anything? Yes... I learned that no matter how dry and tough and tasteless and long a book is, it is possible to finish it. It just takes a long time. Oh, wait, maybe I already learned that when I read "Origin of the Species" by Charles Darwin. Ha, ha. Well, on second thought, I did learn stuff. Mainly it was the overall further understanding of what life was like back then. No doubt, when I'm in college, with many thick, boring books ten times worse than "Of Plymouth Plantation" and one tenth of the time to read them, I will look back and scoff at my 16-year-old attitude towards non-fiction books. Uh, yeah. This is Jenny now. Personally I do not like this book AT ALL from what I have seen. For instance Caryn says once and awhile "I have 50 more pages to read and it takes me 1 hour to read 10 pages" and then I say "ugh x-[". And then later (about 10:53 pm) she says "I just finished the 50 pages! Now I have to read 40 pages of "The scarlet letter"!!". So as you can tell I DO NOT I reapeat DO NOT I reapeat DO NOT I reapeat DO NOT like this book. (or any other books Caryn has to read). So I do NOT recommend this book AT ALL. By the way do you like my nice capitalizations? I am also trying to use long words too. I also really like the idea of reapeating myself. =P Thats about it, I don't have much more to say other then I DO NOT I reapeat DO NOT like this book. Oh and did I mention I DO NOT like this book? although I must admit I have never never never read this book and I never never never never NEVER want to read this book.